BUY THIS ANIMATION of a tangent graph! BUY a steampunk version of this tan graph animation! TANGENT GRAPHS are produced when the tangent value (the sine divided by the cosine) is mapped to the Y axis and the rotation along the x axis. This animation illustrates the relationship between a circle (the wheel in this movie) and the appearance of the tangent graph. As the wheel rotates the pointer (a golden coloured diameter of the circle extended outwards in both directions) traces the discontinuous tangent graph (bright blue) on the purplish screen. 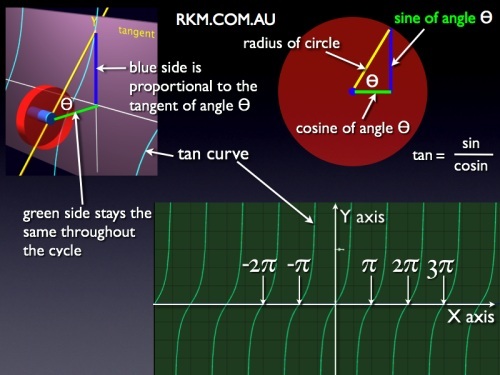 TANGENT CURVE GRAPHIC (at left) explains why the spinning wheel traces out a tan curve. The golden rod is an extension of the circles diameter. It intersects the graph plane (purple) as the wheel spins. This is illustrated for angle Θ. Notice the right angle triangle that results: it is drawn with a vertical blue edge, a horizontal green edge and the hypotenuse as a golden line (the section of the extended diameter that runs from the centre of the circle to its intersection with the graph plane). As the wheel spins the horizontal green edge stays the same length because the wheel remains at a constant distance from the graph plane. However, the blue side elongates dramatically. When the wheel has made precisely one quarter of a revolution (1/2 π radians) the golden diameter line points vertically upwards and so never intersects the graph plane. At this precise point the tan value is infinity. Just before this point the golden line will intersect the graph plane but the blue line will be immensely long. This is why the tan graph flies off to become nearly vertical. At just after one quarter of a revolution (1/2 π radians) the golden diameter line points slightly backwards and its lower extension intersects the graph plane underneath the the image (tan has a negative value). The whole process then repeats itself. TAN = sin divided by cos or the length of the blue line divide by the length of the green line in this graphic.